Ahlen, March 2010. – Immerse in a sea of light and colour: the three new Kaldewei lighting systems for baths – “spectral light”, “underwater spotlights” and “indirect lighting” – make it possible. It has been known for centuries that light and colour have a positive effect on body and soul, and when used in conjunction with water they have an even more intense deep relaxation effect. These three product innovations enable the European market leader for baths and shower trays to emphasise its competence as a wellness expert once again. The new lighting sets for bathtubs make it possible to have an emotional bathing experience in an atmospheric setting. Many models in the extensive Kaldewei range can be equipped with either coloured spectral lighting or underwater spotlights. The underwater spotlight with white light creates an unusual focus in the bathroom and imparts a shimmering sparkle to the bath water, inviting the bather to relax in soothing peace. The spectral light with LED spotlights ensures perfect, deep relaxation and fascinating, individual coloured lighting effects when bathing. It has been proven that colours can release energies with their vibrations and thus have a positive effect on body and soul. Different colours have very different effects: reds improve productivity, yellow-green and green create harmony and stimulate the soul, blue is known as the colour of calm and imparts peace and relaxation. The lighting systems and the individual spectral light combinations are operated with a gentle push of a button on a control panel on the rim of the bath so the desired effect can develop to its full potential in the course of a relaxed bath. And those who do not want to limit themselves to a particular colour can simply opt for the automatic colour spectrum which starts a fascinating show of the various colours and lighting effects. Not only experts on health and wellness, but also architects and designers have discovered the soothing effect of light, because it plays a crucial role in the effect rooms can have and the atmosphere they create. Light is particularly important in bathroom design: it creates a mood and reinforces the relaxation process during bathing. With its new indirect lighting for bathtubs, Kaldewei is the first manufacturer to offer an exclusive and design-oriented solution which combines functionality and appearance to perfection. It casts an even, soothing and non-dazzling light which illuminates the bathtub whether it contains water or not. The four indirect light sources, equipped with white LED spotlights, are flush mounted in the two side walls and are thus harmoniously integrated into the overall appearance of the bathtub. This unusual lighting concept is available for all Centro Duo and Conoduo bathtubs, whose outstanding clear design make them the focal point of any purist-modern bathroom oasis. 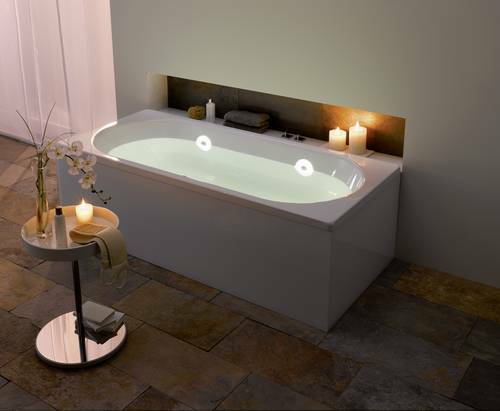 The lighting is controlled via a control panel on the rim of the bath and is thus easy and comfortable to operate when bathing. Immerse in a sea of light and colour: the Kaldewei spectral light with LED spotlights ensures perfect deep relaxation and fascinating, individual coloured lighting effects when bathing. It has been known for centuries that light and colour have a positive effect on body and soul, and an even more intense deep relaxation can be achieved when they are used in conjunction with water. And those who do not want to limit themselves to a particular colour of Kaldewei spectral light can simply opt for the automatic colour spectrum which starts a fascinating show of the various colour and lighting effects. With its new indirect lighting for bathtubs, Kaldewei is offering an exclusive and design-oriented solution which combines functionality and appearance to perfection. It casts an even, soothing and non-dazzling light which illuminates the bathtub whether it contains water or not.